We’re glad you stopped by our website to see some of the life-changing things that God has been orchestrating in meetings all around the world. As you explore this comprehensive site, we pray you’ll be inspired, encouraged, and motivated to join with us to reach 100 million people who need God’s help. We are dependant upon God to be a ministry that effectively communicates the Gospel to everyone who has not made a commitment to Christ by utilizing public evangelistic meetings, radio, television, writing, & Internet. 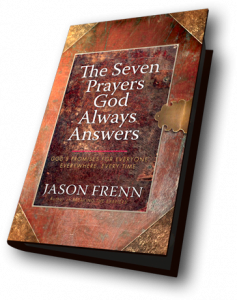 Evangelist and author Jason Frenn details the seven prayers God always answers for everyone, everywhere, every time. In this book, readers will experience incredible insights to the power of prayer, and they will discover something life changing. There are prayers that God always answers with a definitive yes! Find out what they are.